Part-time security guard Dale Parsons has smoked for more than 50 years, but for the new year she decided to kick the habit for good. In addition to her health, she has another big reason to succeed: Her affordable-housing apartment complex just went cold turkey. On Jan. 1, Flagler Village, a 49-unit rental community of mostly duplexes near Key West, banned smoking on the grounds and inside all units. It’s part of a growing trend of residential multi-unit buildings and developments, both privately and government-owned, to implement no-smoking policies. With no-smoking laws covering many public areas — including airplanes, hotels, restaurants, bars, parks, schools, hospitals and public buildings — tobacco-prevention specialists see places where people live as new territory to conquer. “A lot of people are wanting this, just like having a gym on the premises,” she said. But with an adult smoking population in Florida of 17.1 percent, according to a state survey conducted in 2010, extending smoking bans into residences has been met with opposition. “We have ruffled some feathers,” said Mitzy Cordova, manager of Flagler Village, which had smokers in 18 of the 49 units when its ban took effect. “While most residents say, ‘Wow, Mitzy, this is great’ — one has a newborn and lives next to a smoker and does not want her baby to breathe secondhand smoke, I have at least two that say they won’t quit smoking in their homes no matter what,” Cordova said. Among those opposed to Flagler Village’s ban is Wayne Sepanik, who has lived there since it opened two years ago. And the semi-retired 63-year-old is a non-smoker. But the opposite has been true when trying to find a nonsmoking residential rental community along the island chain. Donna Stayton, a health education program consultant with Tobacco Free Florida Keys, said she knows of only about 12 multi-unit developments in the Keys that ban smoking, and most have done so recently. Tobacco Free Florida Keys has helped three of the developments: Flagler Village and Banyan Grove, both on Stock Island and owned by the Wendover Group, and the 2-year-old Poinciana Royale in Key West, which opened as smoke-free. Jonathan Wolf, founder and president of Altamonte Springs-based Wendover Housing Partners, said he had wanted for a while to ban smoking at his 30 affordable developments, most of which are in Florida. Wolf said the support of property manager Cordova and Tobacco Free Florida Keys, as well as the near-Key West location, where there is a huge shortage of affordable housing, made Flagler Village and Banyan Grove perfect communities to start. Wolf expects them to be models he can use to roll out similar bans later in the year at his other properties. Now, housing has become the target of many tobacco-prevention programs. But because people have to live somewhere, it is likely to remain an area that has to be tackled with education rather than laws. “I don’t see any legislation at state levels like there are for restaurants and bars,” said Janisse Schoepp, senior program officer for the nonprofit Health Foundation of South Florida. Property managers and landlords can save money on insurance, maintenance and the costs of turning over a unit from one tenant to the next. Smoking units often require thousands of dollars more to repair or clean due to nicotine stains, cigarette burns and the odor. And it’s a good bet some of the higher costs to clean and repair a smoker’s apartment are passed along to all residents. Monroe County’s adult smoking rates are highest in South Florida — at 21.1 percent, compared to 13.7 percent for Broward County, 10.6 percent for Miami-Dade County and 9 percent for Palm Beach County, the lowest in the state. In Broward, at least 20 residential complexes have gone smoke-free, many with the help of a smoke-free initiative funded by the U.S. Centers for Disease Control and Prevention as part of the Affordable Care Act. Broward is the only county in Florida to receive the five-year Touch grant — Transforming Our Communities’ Health. Smoke-free housing also is getting a boost from developers who covet the prestigious LEED (Leadership in Energy and Development Design) designation, which requires no smoking. A complex called One Plantation in Plantation recently opened smoke-free with the LEED designation, Competiello said. 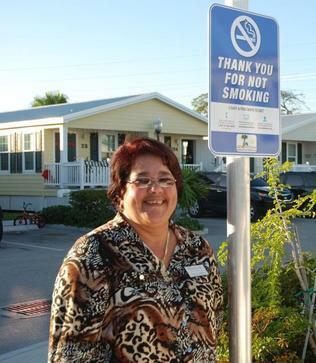 In the Keys, Flagler Village has given existing smoking residents a one-year grace period during which they can continue to light up on their porches.